For those working on master sets of 2013 Upper Deck Goodwin Champions, they've likely noticed a few gaps of missing numbers on the checklist. One of those is #223 in the Baseball Prospect Minis subset. The official checklist has the card missing. But that doesn't mean that it doesn't exist. Chris Doetsch, of Springfield, Illinois, picked up a couple of 2013 Goodwin Champions boxes at the National. The plan was to participate in Upper Deck's wrapper redemption program. 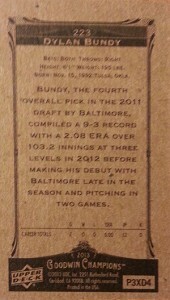 And while that went according to plan, he also uncovered a card that wasn't supposed to be included -- #223 Dylan Bundy. We did confirm with Upper Deck that the Goodwin Champions Dylan Bundy was supposed to be removed from production but at least one, obviously, slipped through. While not numbers were given, it's likely extremely rare. "I haven't really opened a lot of Goodwin in the past, maybe a box or two last year," said Doetsch. "My favorite sport is hockey so I do like finding a lot of the old-school players in Goodwin." Doetsch said he didn't think too much of the card at first. But when he went to research it to sell it on eBay, he quickly discovered it wasn't a standard card of the young Baltimore pitcher. "Now I'm undecided what to do with it," Doetsch said. This is far from the first card that was supposed to be pulled but still slipped into packs. The most high-profile example in recent years is the 2006 Topps Alex Gordon. When Gordon failed to make the Royals' roster, it was supposed to be destroyed. When several started showing up, it gained mainstream media attention and started selling for huge amounts. It's unlikely the 2013 Goodwin Champions Dylan Bundy will cause the same fervor. Still, it's one that collectors should be on the watch for and know it's not just another mini. 2011 Bowman Chrome Draft Dylan Bundy Auto 10 Autograph BGS 9 Orioles Ace 1st Rd. 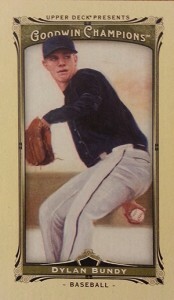 Ijust read the story had to look back at my Goodwin mini cards I have a Dylan bundy how much could I get for this card?? Cameron Oili � None have sold yet so it’s very hard to tell. X-factor is likely the number of people looking to build the full set. Another pitiful try at gaining attention by the crooks at Upper Deck. It won’t be long before they are either begging for a job, on food stamps, or speaking Italian. Sounds kinda sketchy. There’s no way of knowing for sure whether UD really “cancelled” the production of the card because it was a mistake or if they intended to make it a SP since the beginning. Either way, I’m not buying in to it. Seems kind of strange. Good timing too. Sales will probably pick-up due to obsessed collectors wanting every card out there. Kevin � We were contacted by the collector mentioned in the story wondering about the card as he pulled it. UD did not make an announcement. Rather we contacted them to see about the card as sometimes things are accidentally left off checklists. Only then did they confirm it was a mistake inclusion. Rob � It looks like it’s fairly rare. Less than 10 have been listed on eBay so far from a quick glance. Send this article to Keith Olbermann, he corners the market on them and then they’re worth $thousands.